Our unnamed protagonist packs his bags and sets off in search of a new land and a new life for his family. Some unknown evil of dragon descent is wreaking havoc on his homeland and the family must leave. The man – the husband and father – takes off across the sea to a land where he does not speak the language in hopes of finding work and shelter so he can bring his family to safety and opportunity. 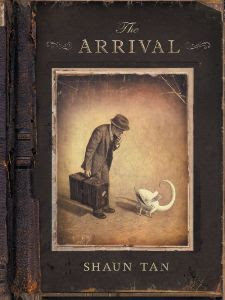 From cover to cover, THE ARRIVAL is a striking piece of comic literature, profound and beautiful, complex and introspective. Every page, every panel, every stroke of the pen evokes a deep sense of connection with the character, and our own history, as he moves from his comfortable yet dangerous life to the new world. The tribulations of the immigrant family have never been so clear, so common, so close, as it is in THE ARRIVAL. 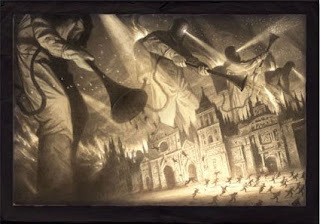 The hyper-stylized story is told without word one, and is drenched in sepia tones giving the book authenticity, history and fantasy, all at the same time. 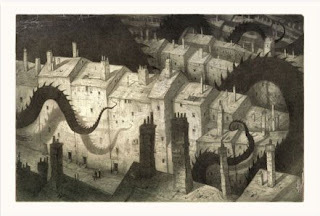 While beasts and creatures run wild in Shaun Tan’s world, they are somehow commonplace and ordinary, so much so that the reader nearly forgets it is fantasy, which is a nice touch. force the family from their home. emotionally, as the man tries to enter the new country. The publisher’s recommended age may begin at 12, but I feel this book is accessible for younger children as well. Some of the complexities and subtleties of the story may be lost on younger children, but we underestimate them sometimes and I think children deserve a chance to experience THE ARRIVAL. 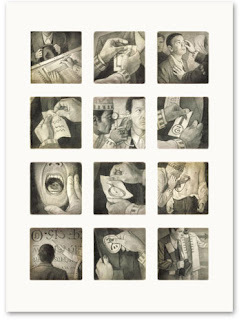 A wordless comic is not easy to read. In many ways, it is more difficult and is much slower. Take your time when reading THE ARRIVAL. Study the faces, the background, and the expressions of the characters. Encourage your students to do the same, or all will be lost. Above all else, this is the story of the immigrant – of leaving one’s home out of panic and necessity due to some unseen forces, and searching for safer ground, a secure home, a new life. This story is becoming more important every day as the global community collides. Helping students understand the struggles of the immigrant family – the fears, language barriers, and culture shock – is important in the multicultural classroom. Younger children may need some assistance with the story, help making sense of the struggle, but when they do they will be able to make connections with the real world, with our world, with our contemporary struggles. Click here to watch this video with creator Shaun Tan. THE ARRIVAL is a beautiful and poignant story, brilliant in its breadth and depth; it is art and literature worthy of any library. It is a must for the classroom.